Noord en bietjie wes is Bloukrans pass. Maar dit lyk nie vir my soos Bloukrans nie. Ek al twee keer oor Bloukrans maar kan nie lekke onthou nie. RovRat............ het jy en Chris nie daardie pad gery nie ? Die man wie eerste n foto het, gooi maar want ek gaan eers later die naweek weer kan post. Nee ons het hom nie gery Fourie ma ek het in 1999. Ons is van Maltahohe reguit Remhoogtepas toe. Draai af net voor Solitaire. Die pas was al parkeer op. Ek sal nie se nie! Right, now this geographical feature is pretty unique - where it are? 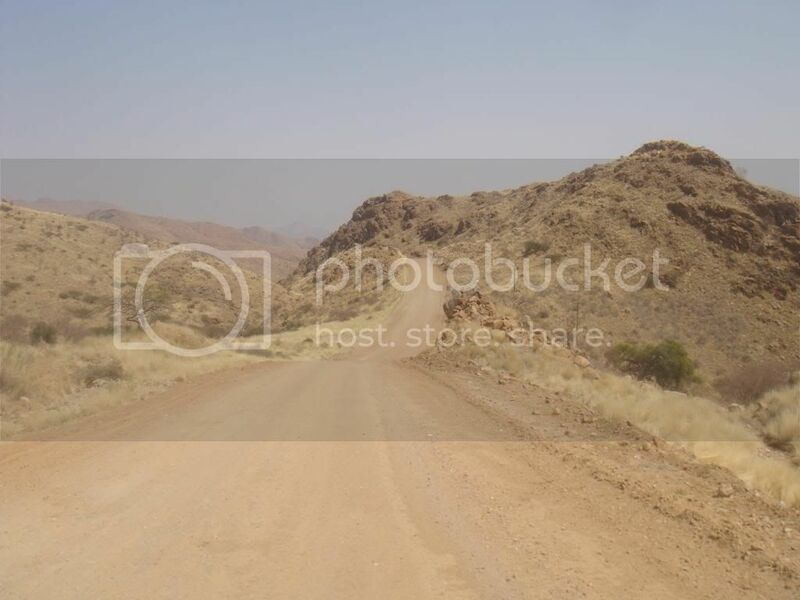 Ok my pic was Spreetshoogte pass in Namibia. Ek het geen idee waar Carnivore se foto geneem is nie. No takers for my pic? KZNner's? Eish, has no one been down this road in Lesotho? Carnivore's photo is somewhere in Lesotho. I have seen it on a few ride reports. Matabeng Pass, near the Poplar Grove Camping spot. OK, then I'll go again... I like this game! Where is this windswept icy bleek brrrrrrrr place? hmmm... just outside Walvisbaai on the road to Swakopmund? That's it! Actually, halfway between the two. It's called Langstrand, and was home for us for 2 days while we explored the area. Here is a pic when we arrived... (much calmer!) The quads (on the trailer) were for playing in the Dunes..
Id say Southern Namibia. Road does not look familiar but those look like the mountains around the Fish River Canyon. The western side that is. If I had to name a road it would be D459 from Goageb to Rosh Pinah or D463 in the same direction. nope... the road is in SA. Somewhere just south of the Richtersveld National Park..? somewhere there, yes, on the road between brandkaros an sendelingsdrift. OK, next item on the agenda is this delightful tribute to the legacy of Mr. MacAdam... not!